I love my career as a Natural Habitat guide because I love wildlife and wilderness, but equally I thrive on sharing my passion of nature with others. There are many reasons which drive people to take trips beyond the edges of civilization to immerse themselves in wild country. Over the years I have had a wonderful variety of travelers join me on expeditions. They include bird watchers to bear enthusiasts, amateur picture takers to famous professional wildlife photographers and film crews, and on several occasions, highly successful wildlife artists in search of inspiration for their work. This article will celebrate some of these creative individuals who can transfer their experiences with wildlife to canvas. One of the first wildlife painters I worked with was the highly successful and well known Debbie Edgers Sturges from Hailey, Idaho, who joined me to photograph coastal brown bears on a Kodiak-Katmai Grizzlies expedition. She, like all of the artists in this post, will only paint scenes that she has experienced first-hand. Her trip to Katmai was charged with excitement as the first runs of salmon entered the river systems. Debbie’s enthusiasm was contagious as she zipped through memory cards collecting images which would evolve into magnificent works of art. 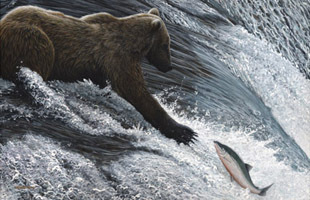 Debbie’s painting “Soaked” shows a coastal brown bear catching one of the first salmon of the summer on the coast of Katmai National Park. 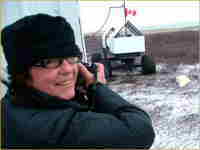 She joined me a few years later on a trip to the Tundra Lodge in Churchill to put the arctic landscape and the polar bear under her belt. Debbie was once again electrified as she observed and photographed polar bears for the first time. On this particular trip in late October the snow had not yet fully covered the tundra, which caused the bears to stand out dramatically against the rich fall colors of the arctic. Towards the end of the trip we had our first substantial snowfall. “I felt like I was Alice in Wonderland going down the rabbit hole. The landscape and animals were white and magical” she recently told me. Two years ago I was in the Fort Garry Hotel in Winnipeg checking the roster for my next polar bear trip. Among the names were Al and Michelle Feldstein. At the time I had no idea that my group was to be blessed with yet another famous, highly accomplished artist! Al has had quite a career as a comic book writer, including creating, writing, illustrating and editing “Tales from the Crypt,” and later he became the editor of “Mad Magazine!” Al actually invented Alfred E. Nueman, the star character of this world renowned publication. Al and his wife now live on a ranch outside of Yellowstone National Park where he concentrates on wildlife art. 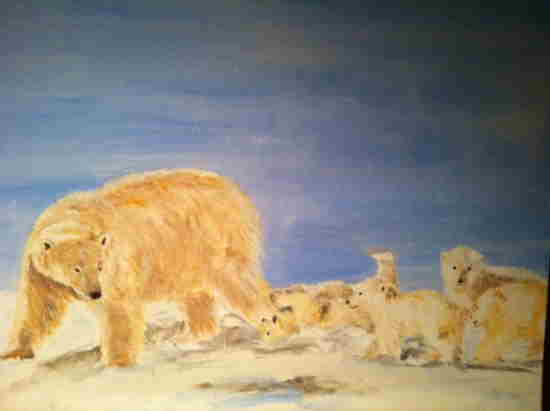 He had always dreamed of painting the mighty polar bear, but he needed to see and photograph them first hand. Apparently he got what he came for. 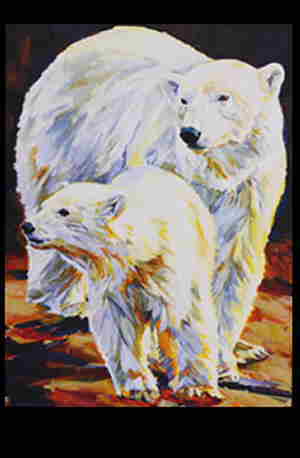 Check out one of Al’s polar bear paintings of a mother bear and her pair of two year old cubs below. 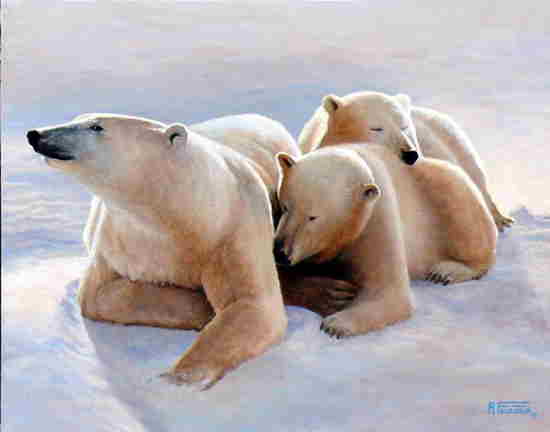 Another extremely talented artist looking for polar bear inspiration joined guide Bonnie Chartier and me at the Tundra Lodge several years ago. 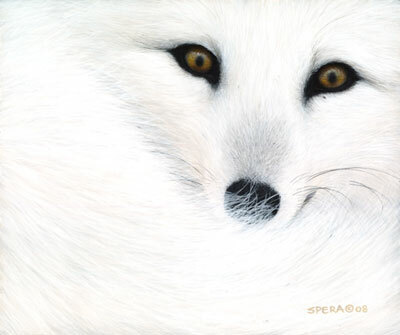 Edward Spera and his wife Lisa travel to all corners of the world to collect images of wildlife that will later help in the creation of paintings that are displayed internationally and in their gallery in Niagra Falls, Ontario. The tundra outside of Churchill exceeded expectations as always, and the polar bear and the arctic fox were introduced into Edward’s collection. 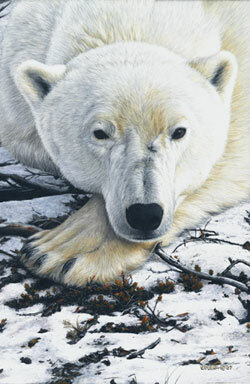 The most recent wildlife artist I met was again in Winnipeg this past fall on his way to Churchill, though he was actually on a Polar Bear Photo Expedition with Eric Rock, our lead naturalist. Satish C. Vyas M.D. is a plastic surgeon from Detroit. He divides his free time between volunteering in his native homeland of India performing charitable surgeries for children and photographing wildlife to serve as a template for paintings… it’s quite inspiring! According to Eric, Satish was really excited. “He was on a different plane” Eric said, and for good reason; he witnessed and photographed countless bears up close. A few weeks ago, he sent us this image of the work he’s completed. The days of appreciating the beauty of animals by hanging their skin or head on a wall are fading. Some gifted individuals can capture the spirit of nature with the click of a camera and the stroke of a brush instead of a bullet. For me, few experiences are as rewarding as assisting in the career of a wildlife artist by guiding them to the right spot at the right time. These works of art are so special because the animals are real individuals still roaming the land past the edges of civilization. To see more from these talented Natural Habitat travelers websites below! Brad is a wildlife photographer, "bear junkie,” and experienced naturalist interpreter specializing in bear biology and ecology of the North Country. 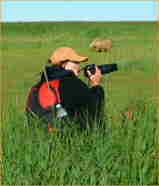 He has been guiding small-group tours for Natural Habitat Adventures since 2005.